A Coca-Cola can from the 1988 Seoul Olympics has been found on a beach in Edinburgh. 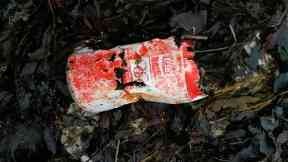 The 31-year-old can - branded with the Olympic rings - was discovered during a clean up and litter survey in Cramond. Marine Conservation Society volunteers collected nine kilos of rubbish in a 100m stretch of the beach last week, including more than 100 wet wipes. Catherine Gemmell, MCS Scotland conservation officer, said: "This really unusual find shows that when it comes to litter there is no 'away' and we need to ensure that anything we are using today is not being picked up by volunteers in 30 or more years' time. "This can is the very reason that we're calling on the Scottish Government to implement an 'all in' deposit return scheme for drinks bottles and cans. "Our data, collected over the last 25 years, has clearly made the case for this and we look forward to hearing more from the Scottish Government soon as to what the system might look like and when it will start."